On their own, these fearless femmes command their own loyal following on social media. But in real life, these epitomes of "unkabogable sisterhood" thrive on sugar, spice and everything nice. Collectively, they're unstoppable! From work to play, these ladies always have each other's backs. Thanks to their ever-growing number of followers on Instagram, these squads are top of mind when it comes to fashion, beauty, health and wellness, fitness, friendship, and all-around girl power concerns. 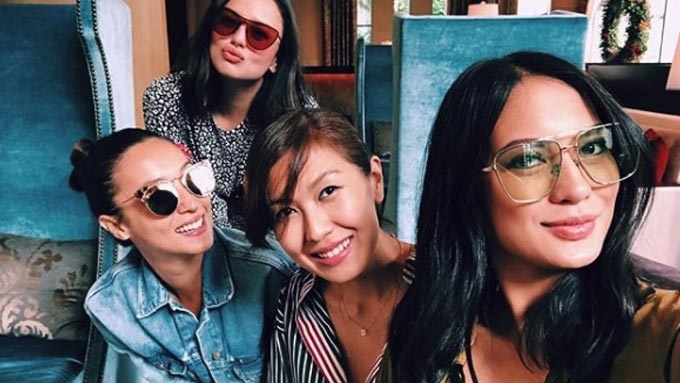 (L-R) Laureen Uy, Nicole Andersson, Patricia Prieto, Camille Co, Lissa Kahayon, and Kryz Uy pioneered the first wave of fashion and beauty bloggers in the now-thriving blogger community. While each member leads her own fashion community, together they are an unstoppable and stylish force to reckon with. If there's one thing that the quirky and bubbly squad of (L-R) Megan Young, Lauren Young, Janna Tee, Maxene Magalona, and Saab Magalona has proven, it's that you don't need to be in the same industry to build a bond. Even though most of the squad members have moved on to married life and motherhood, the It Girls were the original girl group. (L-R) Solenn Heussaff, Jess Wilson, Bea Soriano, Martine Cajucom, Georgina Wilson, Anne Curtis, Liz Uy, and Isabelle Daza (not in photo) were at the forefront of fashion and beauty. Until now, their names continue to be part of the lifestyle scene.